Place meat on 3 air filters leaving the forth one to top it off. 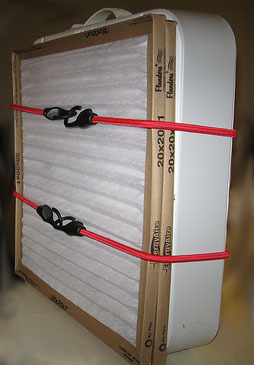 Lay box fan flat and bungee air filters with meat to fan. Place fan up-right and put on medium for 6 hours then rotate and run 4 more hours. Jerky keeps for three years if you can keep it that long. Do Not store in plastic bag, this will re-hydrate meat.